Digium AEX2400E. Digium's VPMADT032 hardware echo cancellation module provides 1024 taps (128 milliseconds) of echo cancellation for superior echo cancellation on both types of analog interfaces. Using Digium's Asterisk Open Source PBX software and standard PC hardware, one can create a telephony environment that includes all the sophisticated features of a high-end business telephone system. Using Digium's Asterisk software and standard PC hardware, one can create a telephony environment that includes all of the sophisticated features of a high-end business telephone system. Using an industry-standard bursting, bus-mastering interface chip that is found within millions of PC systems worldwide, and Digium VoiceBus technology, the AEX2400 eliminates the requirement for separate channel bank and T1 interface cards, with industry-leading performance and price. The quad trunk and quad station modules are interchangeable, allowing the creation of any combination of interfaces. The optional hardware echo cancellation module provides 1024 taps 128 milliseconds of echo cancellation for superior voice quality on both trunk and station interfaces. 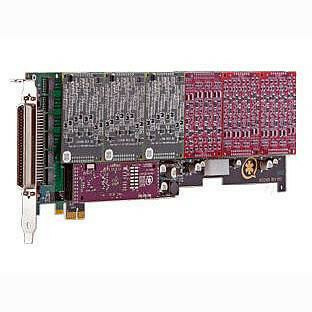 Scaling of this solution is accomplished by adding additional AEX2400 interface cards. Note: The 12V power connector is required for the operation of station FXS modules. It is not required for the operation of trunk FXO modules.